San Bernardino County is by far the largest county in California. At 20,164 sq mi it is essentially twice as big as the next largest county (Inyo County at 10,098 sq mi). All the high desert that it contains was assigned to San Diego County when California became a State in 1850, but by 1852 that country had been given to Los Angeles County. San Bernardino County was created in 1853 out of the eastern 80% of then-existing Los Angeles County, but a county line adjustment with Inyo in the 1870s, and the creation of Riverside County in 1893, cut "San Berdo" to its current configuration. Despite its large size, it is a landlocked county without major bodies of water, and thus its county list is not even the highest among interior counties (adjacent Riverside County, with the north end of the Salton Sea, leads interior totals by about 10 species). There are some lakes and reservoirs in western San Bernardino County but the majority of the county is high desert. Here there are long stretches of bleak country, broken by an occasional well or seasonal stream that serve as migrant traps. In the far east, a series of isolated mountain ranges provide an interesting selection of habitats. Clark Mountain, topping out at 7929' elev (2417m), has been particularly interesting to birders. Here, among an isolated stand of white fir, a number of Great Basin species nest, and such southwestern vagrants as Grace's Warbler, Painted Redstart, and Red-faced Warbler have been found singing in summer. High elevation pinyon and ponderosa pine forests in the San Bernardino Mountains, at the western end of the county, also host a variety of montane birds. County birding statistics and links are on Joe Morlan's site. A breeding bird atlas project has been completed, but it has not yet been published. Coverage of birds along the lower Colorado River — including San Bernardino, Riverside, and Imperial counties — is in Rosenberg, Ohmart, Hunter, and Anderson's 1991 Birds of the Lower Colorado River Valley, published by the University of Arizona Press (it also covers the AZ side of the river). 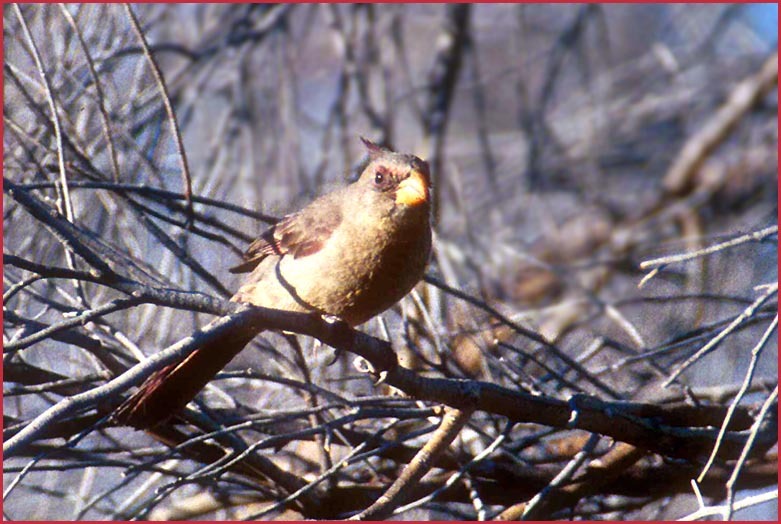 For San Bernardino County I've chosen to feature a rarity: a female Pyrrhuloxia that was nest-building when I took this photo in 1995; we also discovered 3 singing male Pyrrhuloxia here that day. 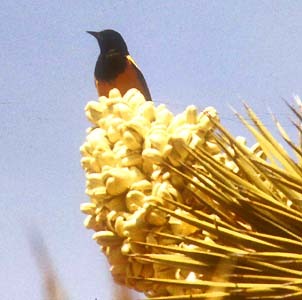 This was one of the very few nesting attempts by this Sonoran Desert species in California; the habitat was mesquite scrub along a dry wash. Much of San Bernardino County is high desert, dominated by Joshua Trees, and a lovely bird in this habitat in summer is Scott's Oriole (below left, on a Joshua Tree bloom, 23 Apr 1978). 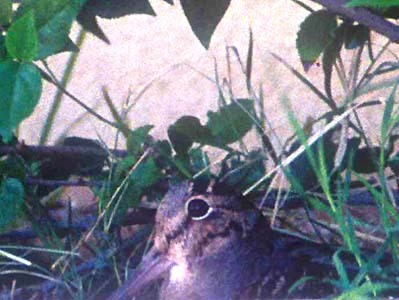 My other photo (below right) features the best bird ever in this county: American Woodcock. I'm the only birder lucky enough to photograph this very elusive individual in California ((or dogged enough to drive all the way there on a negative report; photo 9 Nov 1998 at Iron Mt. Pump Station). Within the vast expanse of San Bernardino County there are many beautiful places. Here's just a few: top — a view of the high desert of Mohave National Preserve shows Clark Mt. 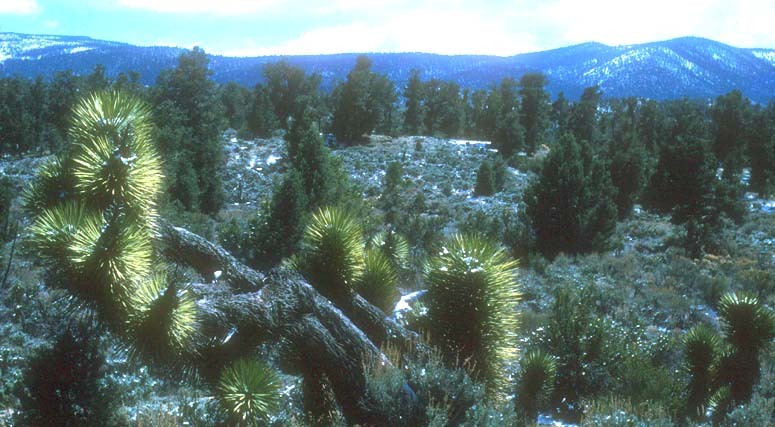 in the background (30 May 2004); middle — a jumble of boulders in Joshua Tree National Park (May 1985); and bottom — habitat along Arrastre Creek Road in the San Bernardino Mts in spring, with patches of snow still present (26 Apr 1984).